Home > Illustrations > "Let’s pretend there’s a way of getting through into the glass, somehow"
When Carroll was asked to write a sequel to the successful story Alice’s Adventures in Wonderland, he naturally hoped that John Tenniel would agree to be the illustrator. Tenniel was a quiet, private man who liked his daily routine and did not seek the kind of recognition that the success of Alice’s Adventures in Wonderland awarded him. He tried to turn down Carroll’s offer, but due to his persistence on the matter, Tenniel agreed to illustrate the second volume in his free time. Because of the long process involved in convincing Tenniel to take the job, and the apparent lack of “free time” that Tenniel had, the book was not completed and published until seven years after the first, in 1871. Nonetheless, Through the Looking Glass and What Alice Found There was still a success with readers young and old. 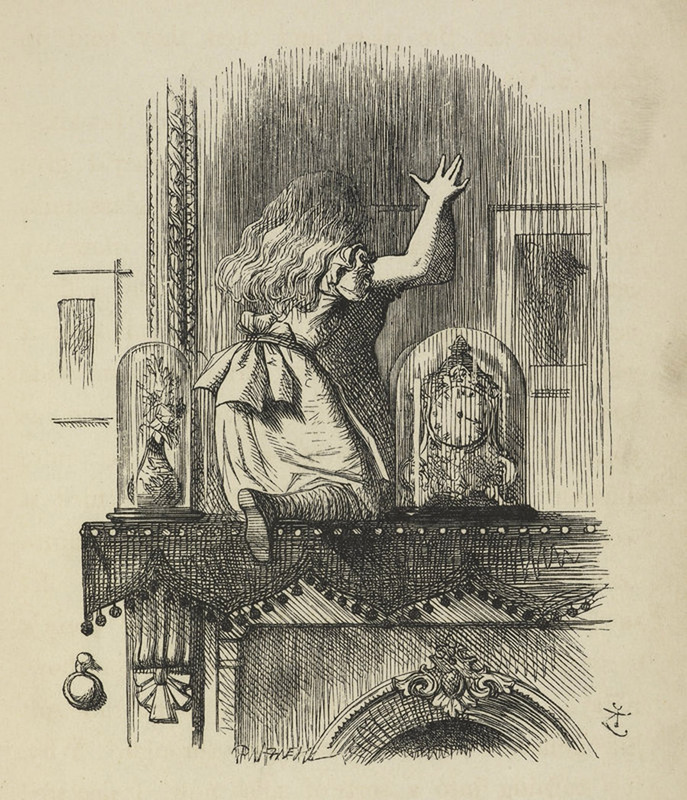 This illustration is presented near the beginning of the story, and shows Alice attempting to find a way through a looking glass over the mantel. Through the Looking Glass begins with Alice discussing “Looking-glass House” with her kitten, and describes it as another place with the same fireplace and the same books, but backwards. She climbs up onto the mantel, and as she describes how she wishes the looking glass would become “soft like gauze” so that she could get through, it dissipates and she climbs through.